They look so cozy. And happy. Awww, those two are precious. This is one of my favorite quotes, and your lovely kitties portray it perfectly. 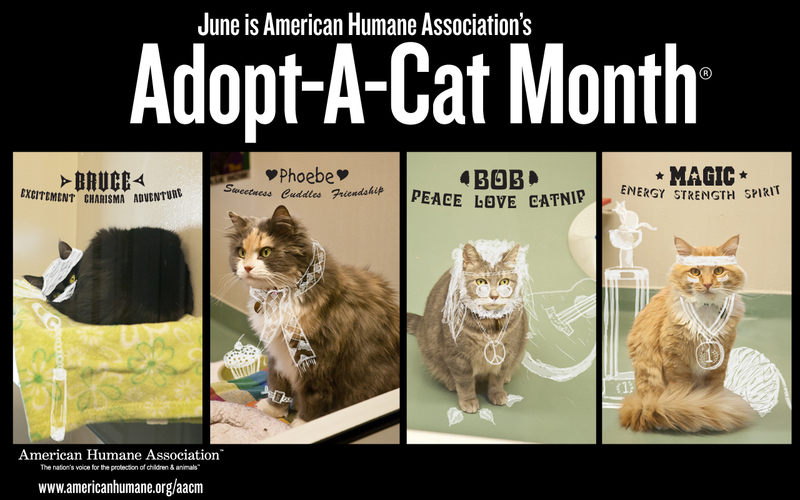 I also love that there is a month dedicated to cat adoptions. Thank you for sharing this with us! Cats! They are such troublemakers! Mom always adopts rescue cats or kittens. We have a set of two right now and have our paws full. Cat bro Bert is nothing but trouble, but we still love him! Ohhhhhhhhhhhhhhhh Ruby mom says a house w/o a cat is incomplete!! Once you add a cat/or a pup it becomes a home. Lots of hugs madi and mom!! Hooray for adoptions, any old time! I love when cats cuddle with each other. Great quote! Great photos. I wish we could adopt a cat, but there are many reasons we can't – top of the list being that Rita HATES cats. ugh. They look like best mates! You two look QUITE comfy there.. What was RUBY doing? Such gorgeous cats! TW would love to adopt more but she has to respect my wishes. That's why we have Rhette, mom says a house isn't a home without a cat to watch enjoying it. Love Dolly PeeS: Excited about next weekend! I love shots where the pets are cuddling together! Hey, we have cats in this home too. They don't cuddle like those two, but they co-exist. Those are two content cats. Oh such lovable, snuggle bugs they are on that couch! How cute they are together! Great quote and those sure are two happy cats. Happy and comfy. Have a great day. Your cats are so striking! Such cuties. A house is not a home without cats in it.